A few reasons the Dow Chemical Company's stock could fall in the coming months and years. While there are some pretty good reasons to believe in Dow Chemical's new direction, the chart above hints at the difficult market conditions facing chemical manufacturers. A newfound focus on high value, high margin products could help the company reach a new phase in its long history, but there are several hidden costs that could derail management's plans. Here are three reasons Dow Chemical's stock could fall in the coming months or years. In December 1984 the Bhopal disaster claimed the lives of nearly 3,800 Indian citizens and injured over 500,000 more -- some of whom subsequently died from their injuries. What happened? A pesticide plant operated by Union Carbide Corporation, or UCC, leaked toxic methyl isocyanate gas after water found its way into a holding tank. While UCC never took responsibility for the disaster, criminal charges and damages lawsuits are still pending in Indian courts. Dow Chemical purchased UCC in 2001, a full 17 years after the disaster, to gain access to its ethylene manufacturing expertise, which are independent from the operations that caused the gas leak at Bhopal. It's important to remember that an acquisition doesn't only include the assets of a company, it also includes the liabilities. Unfortunately, Dow Chemical hasn't taken responsibility for its subsidiary's actions 30 years later -- and it takes a rather arrogant stance against the Indian legal system. The company doesn't once mention the word "Bhopal" in its most recent 10-K. Instead, it lists UCC's potential to have more asbestos-related suits (pending and future claims totaled $501 million at the end of 2013) filed against it in the United States (from the past 30 years) as its most likely source of legal action in the near term. There may not be much the company can do three decades after Bhopal, but there are still thousands living with permanent disabilities related to the disaster. Should international courts get involved with increased interest during the upcoming 30-year mark, then Dow Chemical could be forced to pay settlement fees, fines, or into a fund for the disaster. Every company faces risks related to raw materials, but the stakes are higher for chemical manufacturers. After all, raw materials are mostly chemical feedstocks, and their prices directly affect the price and margins of finished, value-added chemical products. Most chemical feedstock costs are directly related to prices for petroleum and natural gas, which are known to be volatile. Sudden spikes caused by manufacturing disruptions or market-wide changes, whether sustainable or not, could derail an entire quarter or year for chemical manufacturers. For Dow Chemical, raw materials and chemical feedstocks include hydrocarbons, such as ethane, propane, and condensate, as well as monomers such as ethylene and propylene. In all, the company lists 29 different raw materials as "significant" to daily operations. A focus on vertically integrating chemical manufacturing by producing its own chemical feedstocks has helped the company reduce its risk exposure to volatility. One powerful example: ethylene and propylene purchases will soon be supplemented by in-house production at the new Freeport, Texas, facility and other Gulf Coast facilities. Simply put, it's important to remember that much of the company's future business goals and operating margin targets are based on the assumption that low-cost shale natural gas supports production. If an unsuspected event occurs that triggers fundamental changes to the pricing to natural gas, then Dow Chemical's business could be substantially affected. Today, Dow Chemical happily abides by federal, state, and local environmental regulations and mandates across its jurisdictions, but that doesn't change the constant need for remediation of former and current manufacturing sites that have handled less than friendly substances. Additionally, several previous manufacturing sites that were owned by the company or its subsidiaries have had to face environmental regulations for past mistakes -- and even practices characterized as mistakes under current law that weren't illegal at the time the sites were active. At the end of 2013 Dow Chemical had accumulated estimated remediation obligations of $722 million, down slightly from 2012, which included $73 million for Superfund sites. It may not seem to represent a sizable amount of money for a company that generated over $57 billion in sales in 2013, but the total still represents an eye opening 15% of net income! The figure isn't actually an annual cost, although it catches your attention when rewritten in that form. Either way, investors should certainly be aware of remediation costs, especially considering management admits that the reported figure is only an estimate and that actual costs could range "up to two and a half times that amount." Or, phrased differently, remediation costs could represent 45% of annual net income. It's my opinion that Dow Chemical is on the right track to revamp its business by focusing on high value products and that the potential rewards outweigh any potential risks. That doesn't mean risks are nonexistent or that the company's share price won't experience major ups and downs over the coming months or years. Investors that take the time now to understand the potential for hidden costs to cause Dow Chemical's stock to fall can be better prepared for such an event, which may even present a buying opportunity. Will These Megamergers Gain Approval in 2017? 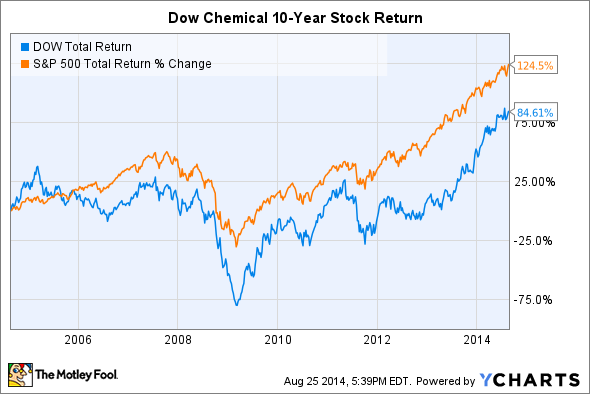 Did Warren Buffett Manipulate the Market in Dow Chemical Stock?